Last night, Pomona Catholic School closed National Catholic Sisters week with a dinner which brought together faculty, staff, alumni, students and their families, and members of the community to celebrate religious life with the Felician Sisters of the area. The week-long celebration, which began with a Mass celebrated by Bishop David O’Connell, was filled with opportunities for the students and other members of the community to get to know the Felician Sisters and their ministries, especially those in the Pomona area, where they have been a presence for more than 70 years. The students also had the opportunity to work on service projects alongside Sister Desiré. The students colored over 100 postcards which will be sent to Felician Sisters, and they helped to paint 40 crosses for the Águilas del Desierto (Eagles of the Desert), a group which searches for and buries the remains of immigrants who do not make it across the desert to the border. 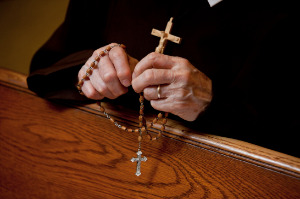 Sister Maria Louise Edwards, who has been working with the Águilas, was able to get help from Felician Associate Leonard Velasquez in purchasing the materials and assembling the crosses, which Sister Desiré then took to the school. 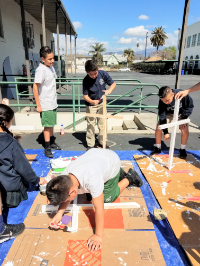 Mr. Miguel Martinez, teacher and musician at Pomona Catholic, worked with some of his 6th grade students to complete almost all of the crosses. 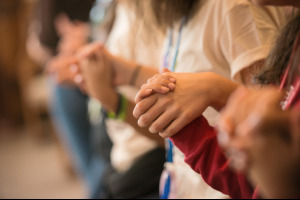 This is the 6th year for the celebration of National Catholic Sisters Week, and it seems to be gaining momentum. Sister Desiré is already thinking about her plans for next year. 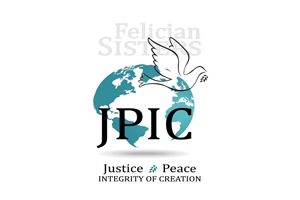 To learn more about National Catholic Sisters Week, go to www.nationalcatholicsistersweek.org.